It seems no time at all since we were organising our Christmas fete but here we are asking you to spring clean your cupboards and donate your no longer wanted (but in good condition) goods. Please bring all donations into the Centre by Friday 10 May. This gives us time to sort and price all items before the big day. 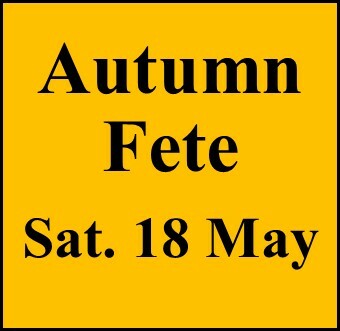 We are planning all the usual stalls for our Autumn Fete — Trash and Treasure, Toys, Books, DVDs, Clothes, Small Electrical items, plants and garden tools, cakes and jams.The craft group are busily making their beautiful items. At the next birthday lunch which will be held on Thursday 9 May, we will not only be celebrating birthdays but also Mothers Day. We will be serving Roast Pork with apple sauce and roast vegetables. This will be followed by self-saucing Butterscotch Pudding. Remember that for those with birthdays in May the cost is $5 and $15 for family and friends. RSVP by 3 May would be appreciated so we know how many people to cater for. Do you know that the Turner Tones have started singing along again on Wednesdays from 1.30 till 2.30? They would love to have you join them so come and enjoy a lift to your spirits in the middle of the week. Cost is $5. Please note the club will be closed on Anzac Day,Thursday 25th April.